A platform, inspired by the science of positive psychology enabling lifestyle management, and overall life assessment using scientific theories and tools. 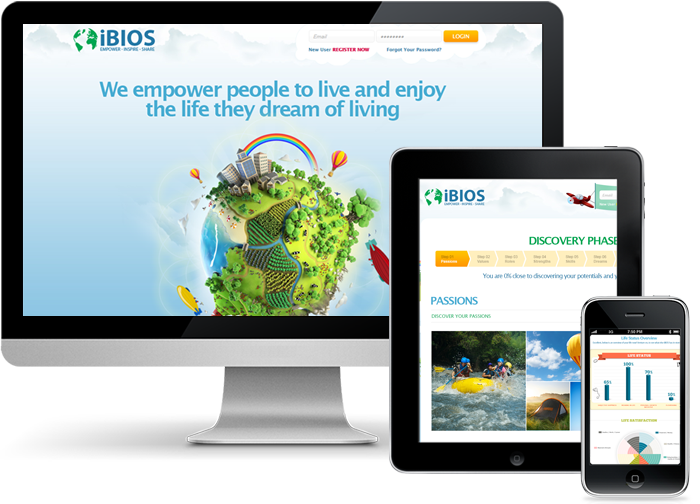 Ibios was a brain child of our client who at that time was a psychology student and wanted to build a life assessment application for his project to showcase user life behavior. The aim of the application was to help users have an overall life assessment and find ways to help them achieve their goals in life in a particular time span. Since the client was a student, he had a clear representation of his idea and some algorithms involved based on his science and research work, but needed technical support to build his idea. This is where our team stepped in and created this unique concept into a fully functional web application. Functionality evolved with the project as the basic architecture of the site needed to keep in mind the future scalability and addition of further modules at a later stage. Requirement gathering and deep understanding of the project was a necessity as sub concepts were involved at each level. Research on the subject matter was necessary to be able to understand the logics to be build. Client had a completely raw idea for his application but had a good understanding of technicalities involved in the project. Our user experience team and analysis team worked hand in hand to be able to document requirements and create Proof of concepts (POC) for the application. Transforming an idea into concepts and then building a smooth seamless application for the user to use was challenging but was really fun to work on. We setup up a dedicated team managed by our project managers and account managers who ensured and enabled a quality product delivery. A team of senior creative designers, HTML developers, and Testing Analysts were assigned to the project. Dedicated resources methodology was followed to provide up to date project management and seamless production execution. Research, analysis and implementation of a suitable payment gateway and currency converter. Integration of custom features like Auto Suggestions, newsletters, payment gateway, and a chat system for customer support. Solutions for view and ordering dive equipment online functionality. Client was very happy with the results and with the way his ideas were executed and implemented. The new application drastically increased registrations, website traffic and conversions making it ready for funding. With the way our team handled the project, the communication, and the final solution delivery, we were able to win Ibios team’s confidence and are now working towards a long term association for developing more unique ideas.